If you are in Cali these days, there are many things you have to visit and know of one of the most important cities of the north of South America: first that you are in the world capital of Salsa, second that you are in the first sugar cane production region of Colombia and third that you are near to one of the most important Archaeological Reserves of the country: The Calima Culture. Detail of Bachué, from Rupestreweb. Among the many mysteries to discover from the Colombian Andean region, Cali is near to one of the most remarkable and the center of much attention from scholars: The prints of an old civilization of the Colombians that was identified as “Calima”. The center of such civilization is today the municipalities of Restrepo, Calima-Darien and some sectors of Yotoco and Viajes in the Valle del Cauca Department, but it is possible that the territory of influence of this people was wider than that. Similar to most of the agrarian cultures of mountains, there are remains of a systematic transformation of hills by terraces to improve agriculture. Several artifacts found in tombs and excavations show a great activity of an almost unknown civilization that lasted since the 1rst to the 15th Century. Rubrics in the area grew the interest of scholars in the long discussion if the Colombian aborigines previous to the Hispanic era did know a certain kind of writing or the rubrics were just graphics that can be found in most parts of the Colombian regions. The mystery of the rubrics still to be discovered since the Colombian “Rosetta Stone” is not yet found. Interpretations are kept in the hypothesis circle of several scholars. If the Colombian “Rosetta Stone” is found, it is possible that we could get to know the life and identity of this unknown civilization that dominated the slopes of the Western Range of the Andean Colombia. The “Rosetta Stone” refers to the discovery in 1799 of a stone in Egypt by Jean-François Champollion that became the key of the interpretation of the Egyptian hieroglyphics. Until then, the ancient writing of the Egyptians was a mystery. The stone was a decree from Ptolemy V written in two Egyptian scripts (hieroglyphic and demotic) plus classical Greek. The fact that there were three languages, made possible the comparissons and for this reason Champollion could bring back to life a very ancient language. Several scripts or graphics of the Pre-Hispanic Colombians are waiting their “Champollion” to give light to an era that remains in the dark in many aspects, although ceramics, tombs and artifacts talk about their creators. The Calean Cultural Corner: at left Municipal Theatre, Museum of Gold at the end, Cali Cultural Center at right and the picture was taken from the Proartes Home by Mania urbana. It is not an exaggeration. Is a fact that can be proven under scientist and geologic studies: Colombia is located on a great rock of gold. According with studies of Emmos, Colombia has the first gold reserve of South America and, at the same time, is the country with lest investment in technical exploitation of this mineral. The main sources of gold in Colombia that were very popular during the Pre-Hispanic era and the Spaniard Colony are today practically abandoned. However this, using very simple techniques for the exploitation of this mineral, the Colombian miners produce a registered number of 950.000 troy ounces per year during the last decades, according with Banco de la República. Example of a Colombian rubric, The Laughing Stone, from Rupestreweb. Of course, this amount is much inferior of that of Peru and Chile, but not because those brother countries have more gold than Colombia, but because Colombia has put little interest in develop the mine technology and the development of the gold regions. According with the Medellin’s Bullet Group, between 1492 and 1934 Colombia produced 400 thousand ounces of gold per year either from mines or rivers. With this it is possible to say that the total production since that year until now is near to 90 million ounces. In this estimate is not taken in account the mineral that was sent to Europe by the Spaniard conquerors, although for many persons persist the idea that “all the Colombian gold was sent to Madrid during the Colony”. The legend of El Dorado is not an accidental story that was born in Colombia and what the Spaniard conquerors were looking through the rain forest in the will to find a gold city, was just everywhere and, technically, still not be seen, but we are on it. Contrary to that, our ancestors, like the ones of the Calima Culture, used the gold in almost all the periods of their life. Thousand of ornaments and religious idols in gold found in tombs and excavations together with clay and stone artifacts, demonstrate how important was the gold in the development of those ancient cultures. It is only through those artifacts that we can know something about the culture and customs of the peoples that settled the area. The Ilama and Yotoco peoples are considered descendants of the Calima Culture that belong to the Caribbean linguistic family and keep relations with Panche and Muzo peoples. The best prove of the reality of the Colombian gold and how important was it for our ancestors, is the existence of the Museums of Gold like the ones of Bogotá and Cali. It is in Cali where it is possible to admire the legacy of the Calima Culture and other peoples that settled the southwest of Colombia between the Andes and the Pacific Ocean littoral. A Calima Helmet from Colombia.com. The Museum of Gold of Cali is located in Calle 7 No. 4-69 and keeps 8 thousand years of history of the Calima Culture. A fascinating and well-documented center for the regional archaeology shows how could be the agrarian life of the Calima peoples of what is today the Valle del Cauca Department. 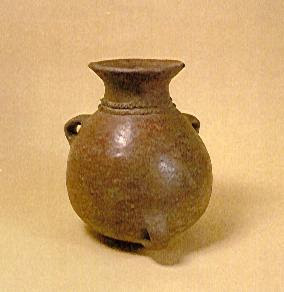 According with the scholars, there were three kind of societies or dynasties within the Calima Culture: The Ilama was about the first century of the Christian era and it endured until the second and third centuries when was the time of what is called the Yotoco society and that was the longer one until the 12th and 13th centuries. The last one that met the Spaniard invaders was the Sonso society. * Mineralización de oro en Colombia. Grupo de Bullet, S.A. Medellín. * Arqueología Valle del Cauca, cultura calima. Sistema Nacional de Información Cultural. Ministerio de la Cultura de la República de Colombia. * MARTINEZ CELIS, Diego. Propuesta para la documentación general de yacimientos rupestres: el petroglífico de la Piedra de Sasaima, Cundinamarca, Colombia. Rupestreweb. * MARTÍNEZ CELIS, Diego ¿De qué se ríe el petrolífico? A propósito de la interpretación de un petrolífico en el altiplano cundiboyacense, Colombia. Rupestreweb. * ROZO GAUTA, José. Bachué: relación mito-arte rupestre. Rupestreweb. * Al día… Boletín Centro de Documentación de Artes Visuales.